Which Online Business Listings Are Important? Are you getting bombarded with solicitations for online advertising? There are hundreds of business directories and they all want a piece of your business. Some are more aggressive than others and most are not worth your time and money to advertise in. But there are some diamonds in the rough. We all know that ignoring all opportunities to position your business online is crazy but how do you choose where to invest your time and resources? This post will help you make some smarter choices when it comes to business profiles. These first two profiles are obviously valuable. No doubt you will want to be found on smartphones to help visitors find your physical location so it is important to understand how people use their devices. Both Android and iPhones integrate GPS mapping functionality into search features. Apple Maps is the primary database for iPhones and Android devices uses the all-encompassing database now known as Google My Business. Although Google continues to change the branding and UI for this product but the database remains the same. Both of these services are free to claim & update and consider them a must for all businesses to do that ASAP. Google uses this same database for many other features that will benefit the business owner. Optimizing your business profiles & remaining consistent in the information you provide to each database is a key to success in local search engine marketing. Optimizing these is a whole other subject that requires a certain skill set, a well thought out strategy and an understanding the algorithm of each digital asset. Yelp, Angie’s List, Thomasnet.com and all the others operate independently and develop their own rules for search. There are literally hundreds of free business listing sites, here is a good list of the top ones. Now what about all the other directories? My first course of action is to do what a typical consumer would do…use your primary keywords in a search engine. Pick your top 2 keyword phrases and add the word “directory” to the search string. Display the actual results by clicking any of these images. We have learned that your clients are looking for options and lists. Therefore the directories that appear on page one of Google or Bing.com for these searches have some value. If it is being used by your prospects to find solutions to their challenges, then you will want to at least have a presence in their searchable database. Each circumstance must be evaluated for the quality of content, number of visitors, domain authority, relevancy, positioning and a few other metrics. 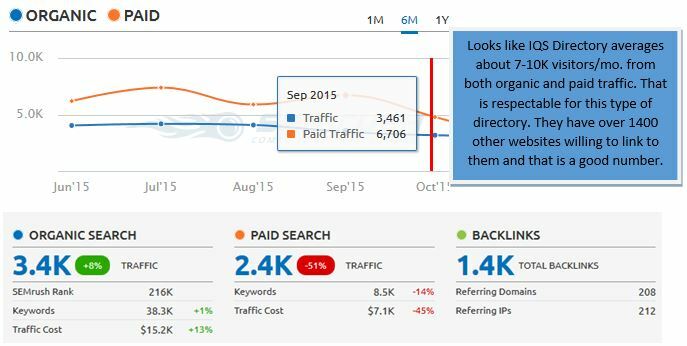 SEMRush has a free tool to help us get an inside look into traffic and relevancy. For this example, we will look at the IQS Industrial Directory metrics: http://www.semrush.com/info/iqsdirectory.com Moz.com has a tool called Open Site Explorer that will tell us more about the authority of a domain and the number of links it has pointing to its pages. In the case of IQS Directory on Moz.com, the home page has a great domain authority for this type of directory. Each tool measures backlinks differently but this too is respectable. I would complete a profile in this directory. Some times we choose directories based upon the social value. Business reviews are very important to many retail, entertainment and service related businesses. More importantly, addressing negative reviews with a proper response or direct outreach to the reviewer is very important to most business owners. If you are not receiving notifications of negative or positive reviews when they are posted, then recovery is not possible. Therefore, claiming and setting up notifications in the Directory dashboard becomes very valuable if your niche is reliant upon social approval. These Directories have great power from the Social Value perspective. But not every industry is impacted by reviews and ratings. Every industry is affected by consumer generated content though and it is important to monitor what is being said about your brand online. We use several tools for our clients to help us “Listen” to blogs, Twitter, public posts on Linkedin and are notified when certain trigger phrases and brand names are used in posts. Many niche directories have good link value. Bright Local published this listing of the top citation sites for 41 different industries back in 2014. The list starts with Arts and Antiques through Wedding Services. Most of these directories are still valuable today. The list includes a Domain Authority score and a link to the “submit your listing” page for each asset. Truth be told, the most valuable thing with these listings is the link equity you get when it is discovered by Google and indexed. So when you complete the listing, get your page indexed by talking about it on reddit, linking to your new profile page in blogs, Google+ and other crawlable content. Know that search engines just don’t get to these profile pages without an alert from a social signal like these. Everyone seems to have an opinion on this topic and we encourage you to share yours in our comments below.